by Haley Goetz I’m a diehard Purge fan and I’m not afraid to admit it. James DeMonaco, the writer and director of all three films, has created a believable cinematic world through his small yet successful horror franchise. Election Year packs the survivalist mentality of the first film while also adding in the craziness from Anarchy, and that’s why it’s so fun to watch. While I wouldn’t say that it’s as bombastic as the previous film, it still delivers some truly noteworthy thrills. The Purge: Election Year takes place in Washington, D.C. in the not-too-distant future. The New Founding Fathers of America (or NFFA) have complete control over the country, and it’s because of them that the Purge exists. For twelve hours once a year, all crime is completely legal. Some people revel in the Purge, while others (especially the poor) must protect their families and valuables from imminent destruction. This Purge is drastically different from the other ones, however. A new president will soon be elected, and Senator Charlie Roan (played by an impressive Elizabeth Mitchell) is rapidly gaining support. Arriving with a tragic backstory, Roan is determined to get rid of the Purge once and for all, for she knows that the NFFA wants to keep it around in order to weed out the poor and make the rich even richer. It is then decided that this year, no one, not even top-ranking government officials, are safe from attack. The NFFA purposely come up with this change at one of their closed-door meetings so that they will have an easy shot of eliminating Roan before she has a chance to win the election. As this series has expanded and progressed, it has gotten smarter with each consecutive film. Election Year provides a wildly original (and somewhat accurate) sociopolitical allegory for our current times. Arriving in the middle of our heated election cycle, a lot of the things that are shown and explored don’t seem too far away from America’s problems right now. Charlie Roan resembles Bernie Sanders in her steadfast determination to make real social and political change. The man running against her, Minister Edwidge Owens (Kyle Secor), is quite similar to Donald Trump with his direct ties to the NRA and plans to make sure that things stay just as radical as they have been. Coupled with this is the fact that the film’s advertising slogan is “Make America Great,” which is missing one other word from directly mimicking a current well-known political slogan. The characters in Election Year are far more developed than in the previous films. 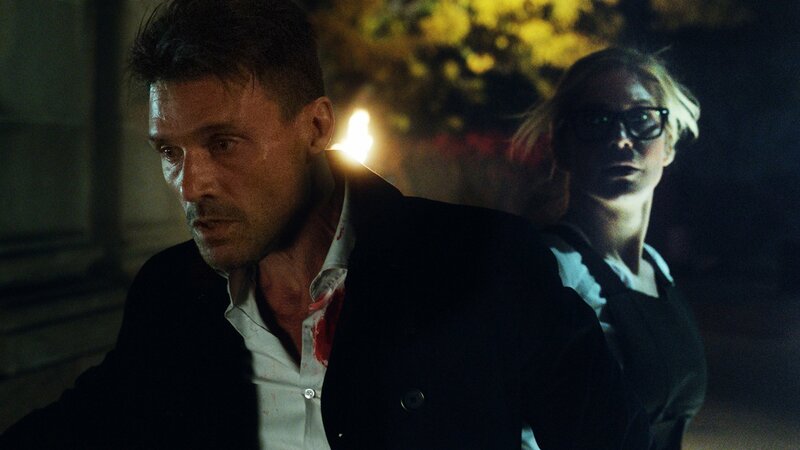 DeMonaco graces us with a recurring character in the form of Leo Barnes (played by Frank Grillo, who rocks a new hairstyle). Barnes is the head bodyguard for Roan, and he really shines in his role this time around. I’ve always enjoyed Grillo’s character a lot. Barnes first popped up in Anarchy as a man on a quest for vengeance. He later undergoes a complete change of heart when he provides some much-needed help to people who are stranded on the streets of Los Angeles. He’s a conflicted man with a difficult past, and this time around he’s trying to do good for both Roan and his country. Elizabeth Mitchell does a great job in her role as a strong woman who is not afraid whatsoever to take a stand against her corrupt government. There’s a new ensemble of characters in this film, too. These people are common folk just trying to stay alive. Joe Dixon (Mykelti Williamson) runs a small deli with the help of Marcos (Joseph Julian Soria) and Laney Rucker (played by badass Betty Gabriel). The trio helps Roan and Barnes when they’re forced to hit the streets after some calamity occurs at their safehouse. James DeMonaco is now a seasoned and well-versed film director. The Purge wasn’t that strong of a film because he didn’t have as full of a grasp on his characters and their emotions yet. Anarchy saw a lot more depth in terms of how the Purge affects people across all socioeconomic spectrums, and I feel that Election Year delves equally as much into this examination. DeMonaco also really knows how to dispense thrills effectively. He’s worked on ratcheting up the tension before the real action begins, and that’s why his Purge series has stuck with me throughout the years. Now, instead of lots of talk, we are given more invigorating visuals of what people actually do as soon as the twelve-hour curtain comes down. If there was one major aspect that is lacking throughout Election Year, it would have to be the cinematography. Jacques Jouffret works well with color and emotive close-ups, but a lot of what is shown is way too washed-out. I found myself squinting at certain points throughout the film because sometimes as much as half of the frame was shrouded in a white kind of mist. I would have been a lot more pleased had more been in focus. Alternately, the film’s score, provided by Nathan Whitehead, is quite good. At times it’s barely present, while in moments of action, it booms. The music is very brusque and filled with staccato, but this works to the film’s advantage. The score almost acts as an extra gunshot at times, as it made me jump more than certain scares. The thrills go above and beyond expectations in this film. I was anticipating them to at least be on par with Anarchy (a film that contained people driving a school bus while blasting machine guns out the windows), and most of it definitely is. However, the scares aren’t doled out as well in Election Year. I understand that more political material needed to be covered in this film, but I still wanted to see more of that guy in a pig suit with a chainsaw (you’ll understand when you see the film). The Purge: Election Year is a great deal of fun. It’s a cautionary tale of America gone sour, and it’s actually fairly deep when you take time to think about it. Along with this, there are relatable characters to root for and some insanely action-packed visuals. This film is not to be missed by any means, especially if you are a fan of politically-charged thrillers.